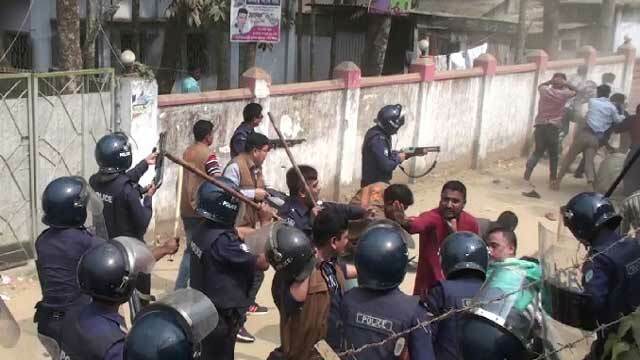 Habiganj, Feb 20 (Just News): The police fired at the activists of Bangladesh Nationalist Party during a demonstration in Habiganj on Tuesday, injuring 20 people. The BNP leaders alleged that they were holding a rally as part of nationwide protest against jailing of their party chairperson Begum Khaleda Zia in a case on 8 February. The police allegedly attacked the BNP men when they brought out a procession led by Habiganj district BNP general secretary and local municipality mayor GK Gaus in Shayestanagar area of the town at around 11:00am. The police engaged in altercation with the mayor and the BNP leaders alleged that he was roughed up on the spot. When the party activists protested at the attack, the police personnel shot at them, they said. "The police assaulted me and opened fire at the BNP activists without any provocation," Gaus said. However, the additional superintendent of police, Ayatunnabi, claimed that the police shot at them for self-defence as they attacked the law enforcers. Those who received bullets include district Jubo Dal general secretary Miah Md Ilias, upazila unit Jubo Dal president Oliur Rahman, and BNP workers Matin Miah, Badshah Siddiqui, Nasir Uddin, Abul Bashar, Selim Ahmed and Tajul Islam. The injured people were taking treastment from clinics instead of going to hospital fearing detention or harrassment by the police. The police detained two BNP workers Faruk Ahmed and Kajal Miah.